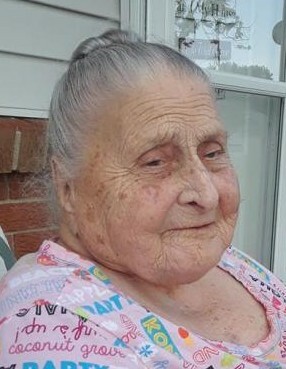 Elizabeth (Boggs) Dillinger, 92 passed away Friday June 22, 2018 at her Franklin, Ohio residence. She was born November 13, 1925 in Ages, Kentucky, to Bish Boggs and Cassie Joseph. Elizabeth married Herman J Dillinger, she also was excellent at fishing and enjoyed gardening. She is survived by her two daughters, Leona G. Tackett, Helen Kay Miller (Bill), all from Franklin; 4 grandchildren: Regina Bohman of Trenton, Ohio; Dwight Tackett of Oklahoma; William Miller (Amanda) of Alexandria, Indiana; Elizabeth Danielle Carner (Mathew) of Miamisburg; 12 great-grandchildren; 7 great-great grandchildren; 3 brothers: Ron Young (Judy) of Beavercreek, Arthur Boggs of Kentucky and Okie Boggs of Kentucky. Elizabeth is preceded in death by her parents, Bish and Cassie Boggs and her husband, Herman J. Dillinger. Funeral service will be held on Monday June 25, 2018 at 6:00 P.M, at Lifeway Pentecostal Church, 2446 Trebein Road in Xenia, Ohio, where friends may meet from 5:00 P.M, until the time of the service. Minister William Dean will officiate. Cremation will follow per Elizabeth's wishes.